Today we took Lydia's parents to the Budweiser Big Sizzle which was the brewery's attempt to break the "Guinness World Records™ Title for Most People Grilling Simultaneously". The day before the festivities I was already getting excited because they'd already set up all of the grills. This is the view from the copy machine room on my floor. After waiting in line a while I just cut the line and told them I work there and we got to go ahead. I'm bad. That cardboard Budweiser cowboy hat we bought on our trip to see the baby Clydesdales at A-B's Warm Springs Ranch came in handy. It was so crazy hot out anyway in the the middle of a parking lot with no shade, then we lit up ~600 grills all at once. I think we were also going for the unofficial record of Most Simultaneous Heat Stroke Victims. Each grilling station had a nice pile of swag including some Bud BBQ sauce and a Bud apron. The organizers were wisely stressing the simultaneous nature of the record we were trying to break, so each part of the process of grilling the one burger we'd been rationed was carefully choreographed. When the Guinness official proclaimed we'd broken the record all hell broke loose. The whole thing was like if a Budweiser commercial had come to life. At the end it was announced that anyone who wanted to could take their grills home could and so a stampede of people dragging their still steaming grills down the street began. 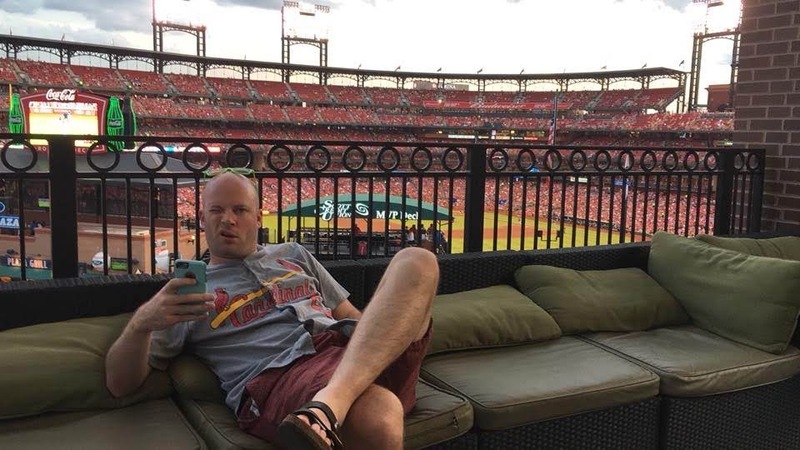 I snagged some Cardinals tickets at work and invited a couple buds. 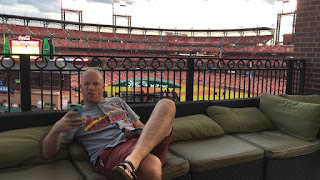 They were for those seats at the Budweiser Brew House outside of the stadium in Ballpark Village, so my expectations were pretty low. When we arrived though a miracle happened: the tickets were all-inclusive. Hurray! If I had known that I would have invited better friends. Oh well. Today we headed out to Warm Springs Ranch where they breed the Budweiser Clydesdales. This visit was a long time coming as it was on our "101 Things Every St. Louisan Must Do" list. Obviously working at Anheuser-Busch added a bit more interest on my part. I wanted to make some friends with the baby horses now so that if we ever see each other at a parade later on we could give each other a wink. And that's called networking folks! Warm Springs is in Boonville out west of Columbia, Missouri which is a pretty good jog from St. Louis. I think they said this place is only 10 years old which I was surprised by. 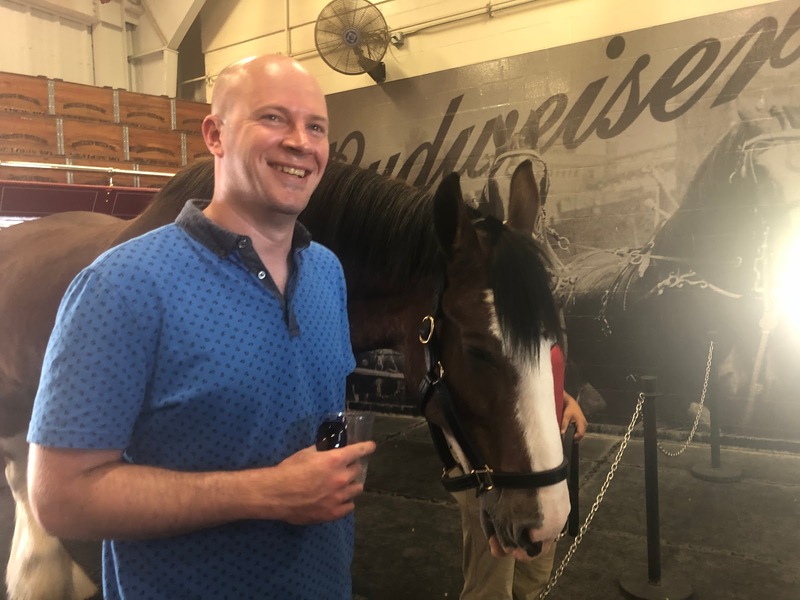 The Clydesdales have been around since the repeal of prohibition in 1933. "Clydesdale horseshoes measure more than 20 inches from end to end and weigh about five pounds - more than twice as long and five times as heavy as the shoe worn by a riding horse." Everyone wanted to say hello to the four day old foal clowning around with its mom in the stables. We got to check out the inside of the truck they transport the horses in for events. There were free Budweisers for everyone at the end. Hurray! Right as we were leaving they led the mom horse away and the foal spastically galloped alongside of her. It was clear it was new at this whole walking thing. Lydia got wild with my employee discount in the souvenir shop. "This "W" is 15 feet tall, weighs more than 2000 pounds, and sat on top of the Bevo bottling plant for more than 30 years. The entire "Budweiser" sign on top of the Bevo building was replaced in January 2013. This "W" was chosen for installation at Warm Springs Ranch, the breeding facility of the World Famous Clydesdales. This little piece of St. Louis serves as an important landmark for those visiting this facility." We took a couple of pictures by the big sign letters on the way out. It was really hot out but it ended up being real fun too.